Bring the fun flavour of the fayre or cinema to your own event with our Popcorn and Candy Floss hire. Our Popcorn and Candy Floss machines are perfect for corporate events, parties, fayres, and receptions or for promotional use at exhibitions. We can supply popcorn and candy floss machines for table top use, on carts, or with stalls. 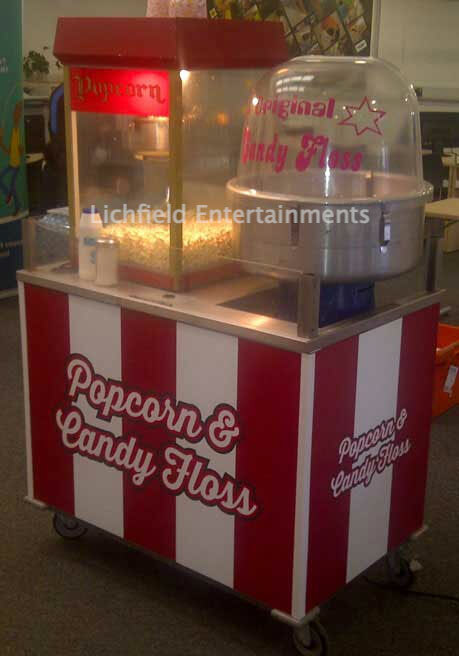 These fun food machines and carts are available for hire supplied either with a member of staff to produced and serve the popcorn and candy floss or on a DIY basis. All machines and carts are supplied with all the consumables required. A Popcorn machine together with Candyfloss machine and one staff member to serve starts at just �250+vat for mid-week dates and from �275+vat on weekend dates depending on the time of year. Candyfloss is available in either traditional Pink Vanilla or for something different why not try Blue Raspberry, Green Apple, Orange, or Banana flavours. The mix is pre-prepared for you and sticks are supplied - either traditional wooden sticks or paper safety sticks depending on your preference. Popcorn can be produced either plain, salty, or sweet. If produced plain we supply salt and sugar shakers for customer to flavour their own. Alcester, Alderley Edge, Aldridge, Alfreton, Altrincham, Alvechurch, Ashbourne, Atherstone, Bakewell, Balsall Common, Banbury, Barnes, Barnt Green, Bartley Green, Barton under Needwood, Beaudesert, Bedworth, Berkswell, Bicester, Bickenhill, Bidford upon Avon, Birmingham, Bridgnorth, Bristol, Broadway, Bromsgrove, Buckinghamshire, Burton, Burton upon Trent, Buxton, Cambridge, Cambs, Cannock, Castle Donnington, Cheadle, Cheltenham, Cheshire, Chester, Chesterfield, Chipping Norton, Church Stretton, Cirencester, Clent, Coleshill, Congleton, Cotswolds, Coventry, Craven Arms, Crewe, Darley Dale, Derby, Derbyshire, Dickens Heath, Doncaster, Dorridge, Droitwich Spa, Druids Heath, Dudley, East Midlands, East Midlands Conference Centre, Earlswood, Edgbaston, Evesham, Four Oaks, Frankley, Fulham, Gloucester, Gloucestershire, Grantham, Greater London Hagley, Halesowen, Hanbury, Harborne, Hartlebury, Henley in Arden, Hereford, Herefordshire, Hertfordshire, Hinckley, Hockley Heath, Holmes Chapel, Huddersfield, Ilkeston, Ironbridge, Kegworth, Kenilworth, Kettering, Kidderminster, Knowle, Knutsford, Lapworth, Leamington Spa, Leeds, Leek, Leicester, Leicestershire, Leominster, Lichfield, Lickey, Little Aston, Lincolnshire, London, Loughborough, Ludlow, Lutterworth, Macclesfield, Malvern, Manchester, Mansfield, Market Drayton, Matlock, Melton Mowbray, Meriden, Middlewich, Milton Keynes, Nantwich, NEC Birmingham, Needwood, Newark, Newcastle under lyme, Northfield, Northampton, Northants, Nottingham, Nottinghamshire, Notts, Nuneaton, Olton, Oswestry, Oxford, Oxfordshire, Penkridge, Pershore, Redditch, Rednal, Ripley, Ripon, Rugby, Rugeley, Sandbach, Sandwell, Sheffield, Sheldon, Shirley, Shrewsbury, Shropshire, Shrops, Silverstone, Solihull, South Yorkshire, St Georges Park, Stafford, Staffordshire, Staffs, Stoke on Trent, Stoke Prior, Stoneleigh Agricultural Centre, Stoneleigh Park, Stourbridge, Stratford Upon Avon, Stroud, Studley, Sutton Coldfield, Swadlincote, Tanworth in Arden, Tarporley, Telford, Telford Exhibition Centre, Temple Grafton, Ullenhall, Uttoxeter, Wakefield, Warwick, Warwickshire, Welford Upon Avon, Welshpool, West Bromwich, West Midlands, Whitchurch, Wilmcote, Wilmslow, Wolverhampton, Wolverton, Wombourne, Wootton Wawen, Worcester, Worcestershire, Worksop, Wythall.